“November jobs report shows an economy straining beneath the weight of a callous GOP special interest agenda that has ransacked the economic security of hard-working families to enrich the already-wealthy. “In the election, voters delivered a resounding verdict against the Republican Congress’ brutal health care sabotage campaign, massive unpaid-for tax breaks for big banks, Big Pharma and big corporations shipping jobs overseas, and relentless attacks on Medicare and Medicaid. The American people will soon have a House Majority that will serve the public interest, not the special interests. Pelosi and her sidekicks’ proposal for ‘a better deal’ is shown below. Dedicate $50 billion to states and school districts to increase teacher compensation and recruit and retain a strong, diverse workforce over the next 10 years. Establish a new $50 billion fund for school infrastructure and resources. Provide additional support to initiatives that increase capacity in Title I schools and ensure all students have access to academic opportunities like computer science, music, and civics. Protect teachers’ freedom to negotiate for better pay and conditions by safeguarding the right of public employees to join unions, collectively bargain, and engage in collective action to support each other. Meet our federal commitment to fund special education. How will we pay for this investment? Face facts, the only reason Democrats want to fund education is to indoctrinate our children with their ideology, and they want to take out ‘crumbs’ back, to do it. 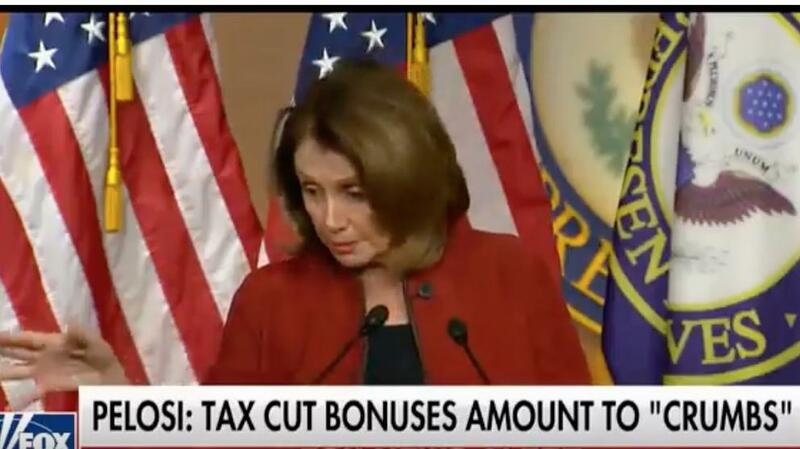 Nancy truly is the gift that keeps on giving. Bless her heart. I hope this old goat chokes on her dentures! Instead of increasing taxes to play Santa to various state governments and special interest groups like the NEA. Just exempt all Public Education ONLY Teachers, in good standing, for Grades 1 to 12 from State and Federal Income Taxes for the 1st $ 75K of their annual salary, after 5 years of contiguous good service. This way the Taxpayer never have fund $$billions, and the issue is resolved WITHOUT the States and US Congress slimming 21++% in handling fees. Wtf indoctrination centers got the 1st odumbo demonRAT stimulus package brought the debt to 19 trillion. The only special interest group Trump is interested in is the American People!!! The Bob Hope clip is GREAT!!! Hand off my Crumbs! Biotch! She would take every penny we make, if she could. I look at her and all I see is an old crook! She needs to retire and go away,. For good! Pelosi and company disgust Patriotic Americans who are awoke. The Storm is here. God Bless our Republican Majority Senate.